This entry was posted on Wednesday, February 16th, 2011 at 5:00 am	and is filed under Culture, Parenthood, Psychobabble. You can follow any responses to this entry through the RSS 2.0 feed. Both comments and pings are currently closed. I think you make a really good and salient point here – the importance of expectations. And celebrating achievement because of hard work rather than just for showing up. I think there’s a fine distinction between loving our kids NO MATTER WHAT, just for who they are, and creating artificial achievements to laud. I think the former is critical, essential, vital. I think the latter is a bad idea. I’ve read over and over that we ought to celebrate our children for effort and hard work rather than innate ability, and I think the latter muddies this. By applauding achievement we can create more resilient kids: if you fail, it’s because you weren’t going about it right. But if you are always celebrating innate ability, and a child fails, that reflects more on them and makes bouncing back harder. Lindsey – I really like your point about praising innate abilities versus effort, and kids’ abilities to bounce back from failure in each scenario. I’ve heard this before, but had forgotten it, and I think it’s and important distinction. If children believe their accomplishments stem from innate ability, then any failure is a reflection of some internal (and irreparable?) flaw. But if they believe that their accomplishments are the result of hard work, strategy, learning, etc, then failure means only that some aspect of their performance equation was flawed, but not that they, fundamentally, are flawed. It is so easy to tell our kids that they are innately wonderful (and as their parents we are absolutely entitled to believe that they are), but we have to be careful about the longer term ramifications of the messages we give them. Thanks for your perspective here, and for inspiring this pair of posts! I’ll be interested to see the research, but I’m betting it’ll support your theory. I think Lindsey makes a good connection here–that expectations and lofty goals (ones that take time and effort to reach) foster resilience. I think resilience is SO important in life, and I think we’re cheating our kids nowadays by rewarding them for everything. God, I sound old when I say that, but it’s how I feel. This is an interesting subject, but when I look at my life, the schools my children attend and the activities in which my children participate, I don’t see rewards for no reason. I see expectations unlike the expectations I had as a child. Let’s look at my daughter’s public elementary school as an example. Talking is not allowed in the bathrooms or hallways. There’s no chasing the opposite gender on the playground threatening to “kiss” them – that would be sexual harassment. There was no kindergarten graduation (although she did have a preschool graduation…but I think moving from preschool to elementary is a big deal so I’m okay with that one). The character education is unlike anything I could have dreamed of when I was in elementary school. They learn to put first things first (work before play). They learn to listen before speaking. They learn to be proactive and to work together – my first grader knows the words PROACTIVE and SYNERGIZE! The kids take surveys and determine where their strengths are/what kind of leader they are – public speaking, art, music, helping others, etc. They learn to shake hands firmly with adults, look adults in the eyes and introduce themselves. They know the names of their bus drivers and the cafeteria staff and the janitorial staff, and they appreciate these people. They do all this on top of learning to read, learning to write, completing their math, science and social studies lessons. It is absolutely amazing. They take accelerated reading quizzes on every book they read, and at quarterly school assemblies, the principal reports that overall the school read Y number of books which was in excess of their goal of X number books. Some quarters the principal reports that they fell short of their 85% reading comprehension goal, and the kids leave the assembly knowing they need to slow down when they read so they can increase their reading comprehension. There’s no sugar coating. I truly believe we are in a time unlike any other with children learning about character, leadership, anti-bullying, personal responsibility, etc. Perhaps there are parents who are raising their children to feel entitled, but that’s not new – I’ve know people like that all my life. I truly don’t believe what you are discussing is the schools, and I look forward to your more empirical post on Friday. The schools that are succeeding like my daugther’s school don’t do that. And the schools that are failing are doing so because they don’t have money, they don’t have good teachers, they don’t have strong curriculum – and my guess is that the children coming out of those schools don’t feel entitled, they feel forgotten and lost. Sorry for my long, soapbox of a comment! Laura H – Thank you so much for this comment. Since IEP is two, and not in school yet, I don’t have the frame of reference that you do. And I am very encouraged to hear about the expectations that are set by your kids’ school. Perhaps my gut reaction is misguided? This is one of those issues where I’ll be happy to be proven wrong! I am most intrigued by your comment, “I truly don’t believe what you are discussing is the schools…” Based on your description, it sounds like you’re right. The schools – the good ones anwyway, with good funding and good teachers – are doing their part. But as someone who’s been at this parenting gig longer than I have, do you sense any of what I describe in the parenting culture? Do you find that kids are praised excessively, even if informally? Do you find that kids do or don’t feel the need to meet certain expectations in general (not just in the classroom)? Your comment touched on part of GAP’s original objection to this post, and that is the fact that this is largely an upper-middle class problem. He pointed out the number of kids living below the poverty line, the number of kids without any support or encouragement, and the fact that fussing about over-praising that may or may not occur in more privileged sets is a mere distraction from a bigger and more important issue; namely that kids from more challenging circumstances are largely overlooked. In my research for Friday’s post I’ve been looking at poverty rates and action plans for achievement in those demographic sectors. And I will be sure to address that sphere of this issue when I write Friday’s post. Thanks again for your comment – truly. I appreciate your candor and cotext. It adds wonderful dimension to this discussion. I think you know how I feel on this subject – and I agree with you 100%. Support – of course. Unconditional love – absolutely. Praising effort (yes) – but not rewarding every little thing, and teaching kids to win and lose (both) gracefully, with appropriate and challenging expectations – as appropriate for age, the individual child, and the situation. We need to expect more of our kids. I have expected high performance from both my sons – had to motivate them differently – and held varying expectations based on their passions and abilities. Given that they’re 17 and 19 – I’d say that’s enough time to reasonably guess that this approach has been manageable, without turning out crazed kids. They’re still good, fun-loving kids. But they know the world is competitive, and they know you win some, you lose some, but if you don’t try hard – you get nowhere. Gale, I love this post. I have four children currently in the public school system – high school, middle school and elementary school- and my experience has been NOTHING like the experience described by Laura H. above, which would be more descriptive of a private school experience around here. Mine is a large, affluent, suburban New York City district that certainly has money, good teachers, and strong curriculum. But I do totally agree with Laura H that we are not discussing the schools here.The topic that most absorbs me is the parenting culture. And it’s more subtle than entitlement, though I see that exists. I’m sorry that GAP pulled the “elitism” card on you. I’m certain that this parenting issue is not relevant to populations in poverty, where there are other more pressing – and maybe more important – concerns, but does that invalidate our discussion? The writers and readers of the blogosphere in which I found your comments seem very interested in the topic of the “achievement culture.” I’m sure you will find “research” to support any stance you want to take. But I’m looking more forward to your feelings, observations, intuitions and your “ten dollar thoughts” – and questions. Thanks Gale. Good questions, and I always enjoy thinking about your posts. So here goes, and again I apologize for the length of my comments. Perhaps I keep good company, but I think for the most part the parents we know are in-step with my daughter’s school, and are teaching personal responsibility, not entitlement. The school has made their character education into a language, so the kids are bringing it home, and we embrace it. I am sure there are parents who don’t embrace it and don’t want to hear when their child is disobedient or having a difficulty or delay. I will admit that at times, I’ve needed to put myself in check when I’ve allowed the busy-ness of my life to let some not great behaviors slide. For instance, it was very difficult for me when I had a preschool teacher tell me that I shouldn’t allow my 4 year old to treat me the way I was allowing my daughter to treat me; and that my daughter was old enough to not interrupt me, or push on my legs or stand on my feet when she was attempting to interrupt me while I was talking to her teacher. So I can see how these things happen, but having good educators and other parents around me, and having my own interest in the development of my children and in educational and parenting philosophies, has kept me on the right path. For parents who aren’t as interested in their children’s development and education – I can easily see them slipping into the entitlement path or the neglect path. So maybe it’s the school, or that I live in an upper-middle class area, but from the sample of kids and parents I see, I believe the overwhelming majority are not raising their children to feel entitled. If I sent my child to a private school where parents are paying a large tuition, and perhaps also making large donations, maybe I’d see more entitlement. I’m not sure. I do have to say anecdotedly, that I saw more entitlement issues in my peers at my small private college than I did in my large public high school in an affluent suburb. Also anecdotedly…I think it’s in the natural make-up of a lot of teenagers to not want to do anything and to have a sense of entitlement, despite how they’ve been raised. I was a pretty grounded, high-achieving teen, but I remember being displeased when my parents got me a car that was used and white instead of new and red. I look back and think, “they got me a car! what was I complaining about? !” So I have no idea how any of my thoughts about schools and parenting apply to teenagers!!! I’m so intrigued! Without revealing too much can you tell me which region of the country you are in? Maybe my experience is more shaped by where I live than I thought (although I hear anecdotes about the same issues from friends elsewhere and am supported by the nation-wide sweep of “Race to Nowhere”). I, too, “keep good company” and my circle of friends and I are very interested in raising children with character, but we are increasingly concerned with the larger picture, the larger community and how it becomes more difficult when your children leave the nest of your influence and move more into the world. I urge everyone to see the documentary “Race to Nowhere” which describes a lot of what I see in my community. I don’t agree with everything in the movie, but it is way too familiar. I do believe that we collectively as a generation of parents created this situation — but how do we get out of the race now? Sandy – Thanks for your feedback, and for encouraging me to write this post in the first place. I am intrigued by the differences between your experience and Laura H’s. I suspect that regional influences are at play here. I wonder if being in suburban NYC makes a difference. Given that the uppermost eschelons of affluence in the NYC area are much higher than the uppermost eschelons of affluence in other parts of the country, does it stand to reason that your public school experience is more like a private school experience in less moneyed regions? I think it’s really important to note that the chorus being sung in these comments is that we are discussing a parenting culture much more than a school-based culture. This encourages me because it means that we, as parents, have more control over it. We don’t have to battle the culture (or curriculum or policies) of an entire school system – just of our own families. Naturally there is a larger parenting culture at play here – peer pressure in adult circles can be just as persuasive as in kid circles – but at least the forces against us are not institutional in nature. As for the “elitism card” – I don’t see it that way at all. Of course this is a problem limited to families who are fortunate enough to have it. I agree with you that just because it’s a problem of privilege doesn’t mean it isn’t still a problem. And I made that very point to GAP when we discussed it. Obviously I believe that this is a real issue because I wrote this post and I believe in what I wrote. (Additionally, as a reasonably privileged family it is a problem we are likely to encounter ourselves, and I think that awareness of such problems is the first step in circumventing them.) But GAP’s charge to me was to see the whole picture. It is easy for those of us who live comfortable lives to focus only on the problems that befall us. It is uncomfortable to consider kids who dream of having these problems. And if we care about children’s achievement in aggregate, I suspect there is an argument to be made that we could better accomplish this by providing more support to underprivileged kids than we can by providing less support to affluent ones. I still stand by what I wrote, but I stand by my husband too. As a parent, I try to ensure that my kids know I love them no matter what. But I also make sure they know that effort matters. If my son is getting a C in math – the issue isn’t the C, it’s the effort he’s putting in. If he is trying, trying, trying, maybe honors math is simply too much. And there’s nothing wrong with that. If he’s lazy, that’s another story and that’s where I focus my attention. Reward for effort – not achievement. The idea that “every child is special” and deserves an “A for effort” has its place for sure. But I tend to see these kids when they reach college-age, and employers don’t reward that way. They get the job or they don’t. And often the students are flummoxed as to why they don’t get the job, the promotion, the admission to grad school. Basically, I think kids need to know that achievements require hard work. And I think you can convey that without being the equivalent of a pushy sports parent. I think the important part (which Laura alludes to) is that you help kids find what it is they DO excel at, and support that in a reasonable way. I think the problem often comes from parents wanting their kid to succeed in a very specific arena–be it music, math, sports, etc–and devalue some of their other innate gifts. 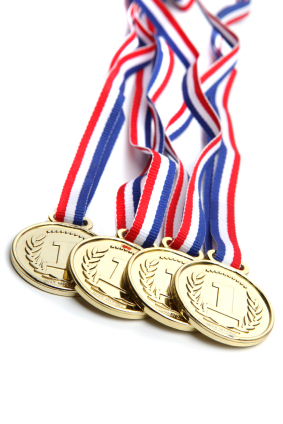 Our system places a higher premium on certain achievements–often the scholastic ones. And that’s not all there is to being a successful person. Any thoughts on how media, especially television, and popular culture affect the current achievement culture in which our children live? Music icons, movie stars, song lyrics, star athletes, reality TV, television shows aimed at children- do these things cut through the boundaries of privilege? How insidious is the media in shaping character and values? Sandy – I’ve touched on the nature of media influence in other posts. It’s an interesting question. I think most of the studies show that good parenting trumps bad media, but I can’t help but believe there is media influence. I’m currently reading Cinderella Ate My Daughter, which is proving fascinating in this realm (i.e. influence in general, not just in terms of achievement). I’ll be interested to finish the book and see what conclusions it draws. GAP has a valid point. Most extended discussion of this topic takes place among upper middle class families, where there is time to think about “performance,” being fulfilled and being a good parent. In families where making a living from one day to the next is the critical issue, I would doubt there is much extended discussion about these issues. I have coached–both in the athletic sense and the real life sense–individuals who were not offered encouragement as children. In those cases, what they desperately needed was praise of almost any kind to increase their self esteem. Overall, my view is about the same as Anne’s and Big Little Wolf’s: This issue is not a dichotomy, go no-go, black-and-white, 0s and 1s matter. It is an art and not a science. Different children have different needs. Each child has different needs at different times. If a parent’s real job is to nurture and “create” a competent individual with a healthy attitude toward life (or whatever words you want to use that convey success, happiness, etc. ), then you use whatever tools are needed to reach that goal. When seen in that light, praise, criticism, expectations and demands become ingredients that a parent mixes with care. Such a thoughtful, well-crafted piece. I do think there is a fine line between loving our kids for who they are at the moment and crafting expectations for who they might become. I don’t pretend to know where that line is, or looks like. Personally, I know this will be a bit of a struggle for me as I have always been hung up on quintessential markers of achievement (grades, schools, etc). Wonderful words, Gale. Sandy – I’m in the midwest in a suburb of a large city. If you are interested in the character education curriculum, you should start by reading The 7 Habits of Happy Kids. My 6 year old can recite the habits. Anne – yes; it’s all about helping children find their strengths and manage their areas for development. All the kids have personal achievement notebooks where they identify their strengths and weaknesses and make goals to improve their weaknesses and to track their progress. This issue is near to my heart, both as a mother and an individual. While, I think I generally agree with your argument, indeed expectation can be a positive motivator, I think it’s a careful path we must tread. I’m trying hard to raise my children with the attitude that anything worth having is worth working for, and to value effort over achievement. Achievement is important absolutely, but I think as a society we have ill-defined notions of what success looks like. To me, the important thing is if they try and learn along the way. Then if they find, through honest effort, that something is not for them, then I am happy to let them abandon it. Too often we are taught that we can’t make changes in our life, society perpetuates a standard about how we should be and what we should be reaching for. My children attend a private school where the school has a philosophy that is a mixture of academic achievement and character. One of the reasons that we send them their is because we are trying to raise menschen. If you are unfamiliar with the word, it is Yiddish (most times written as Mensch, the singular) and it refers to a person of character. I want children who are productive members of society who can get along with others. My kids are smart and capable. I want them to do the best that they can and I want them to earn it. I don’t want things just handed to them for showing up, but I want children who know how to think. I don’t want automatons who can regurgitate whatever is asked. FWIW, there are two things about the school that concern me. It is very affluent and there is a certain sense of entitlement among some of the students. Many of the families have second homes, vacation in Europe during Summer and ski somewhere else during winter etc. And while I appreciate that they look after the emotional growth/well being of the kids, I worry. I worry because it won’t be like that in the real world. So I want my kids to learn how to think, to work hard and to learn how to fail. They need coping skills for when life gets rough because it will.